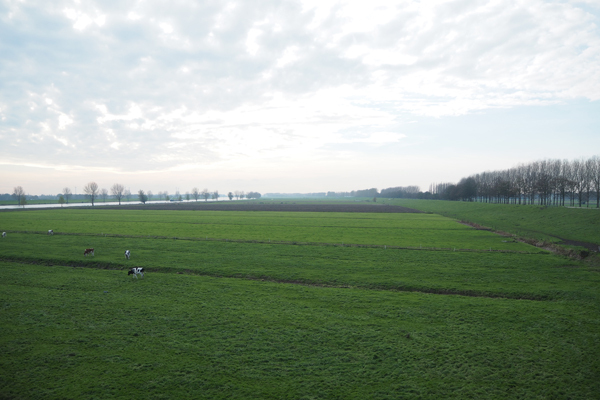 3 years ago, Nellie and I were in Amsterdam for the first time and we wanted to be there in time for tulips season. 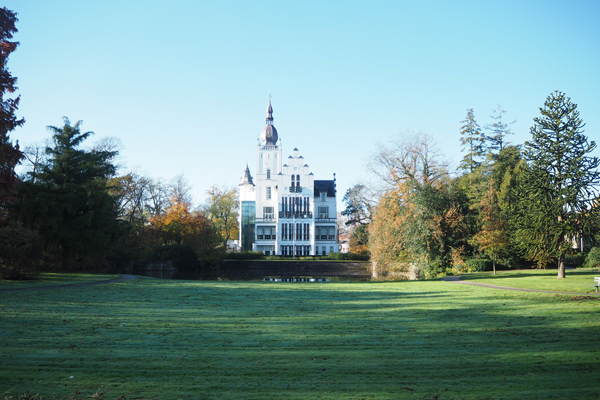 It turned out that we had a wonderful surprise which was also coincided with Queen’s Day. It was particularly special because Queen Beatrix abdicated her crown to her son, Willem-Alexander. We stayed in the city center on Koningsstraat, Dutch for King’s street, another coincidence?! I will never forget that trip. I had my days of partying at music festivals but the Dutch really knows how to throw a party! DJs playing EDM at every corner and on boats which were filled with people dancing. Did I mentioned that vehicles were banned from the city center? On the day of Queen’s Day, everybody was sporting their best orange outfits to signify their love for their Royal Family and national pride. The spirit was there for King’s Day in SF this past weekend. Although SF is nothing like the Netherlands in terms of bike infrastructure, we celebrated King’s Day festival with a nice bike ride around the northern west corner of SF. The meetup began at 10am at Dutch Windmill in Golden Gate Park. We started the day with some delicious home-made stroopwafels. 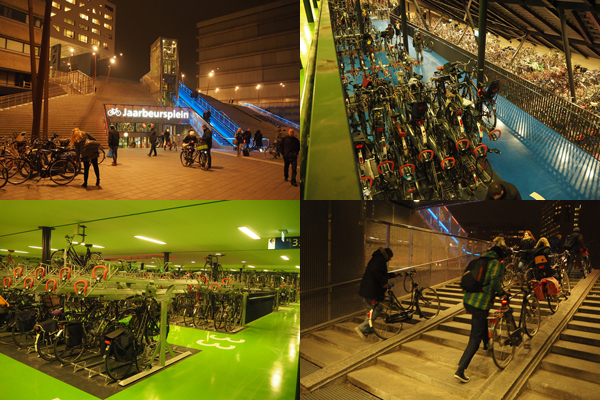 Also, there were Dutch-designed Gazelle bikes for free rentals. It was really nice to speak to a lot of Dutch folks. One Dutch guy thought I was Dutch because of how I am fascinated with their country. Of course, a ride in San Francisco will always include those breath-taking views. Here are some photos that I want to share. The bike ended at Murphy Windmill where the festival was at. I was really surprised to know that there is this great Dutch community in the Bay Area. Who would have known? The festivity here in SF carries the same traditions as back home for them. For example, children were selling their used clothes, toys, and books. Face-painting is another popular thing in the Netherlands. And if you haven’t tried raw herring, you must do so when you get a chance. Somehow, you will feel that joy when you try it. Till next time, Happy Riding! 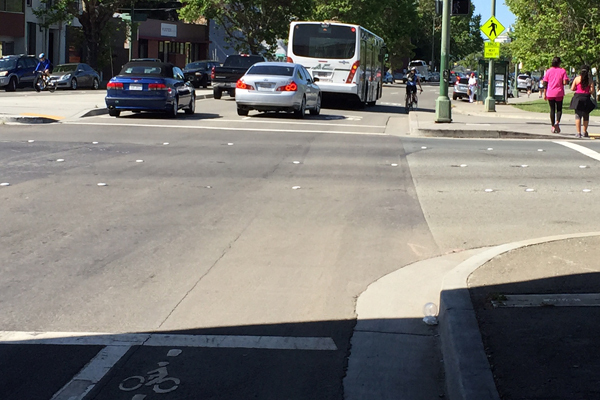 Do you ever wonder why all of a sudden a bike lane ends for any practical purpose? It’s most likely because space for cars is more important than your safety on the road. As long as there are enough space for both cars and bikes, then you will have a bike lane. Where that’s not possible, bike lane will most likely convert into a bike sharrow or disappear altogether. And street parking is usually the culprit. The watered-down Polk Street plan in San Francisco is a prime example between car parking vs bike safety. 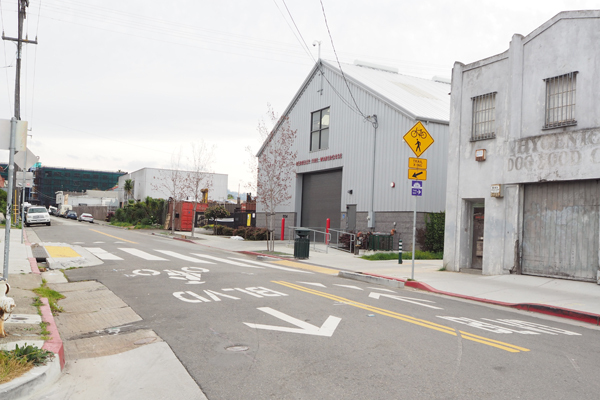 On Polk St., merchants or shop owners believe that their customers need street parking to frequent their shops. 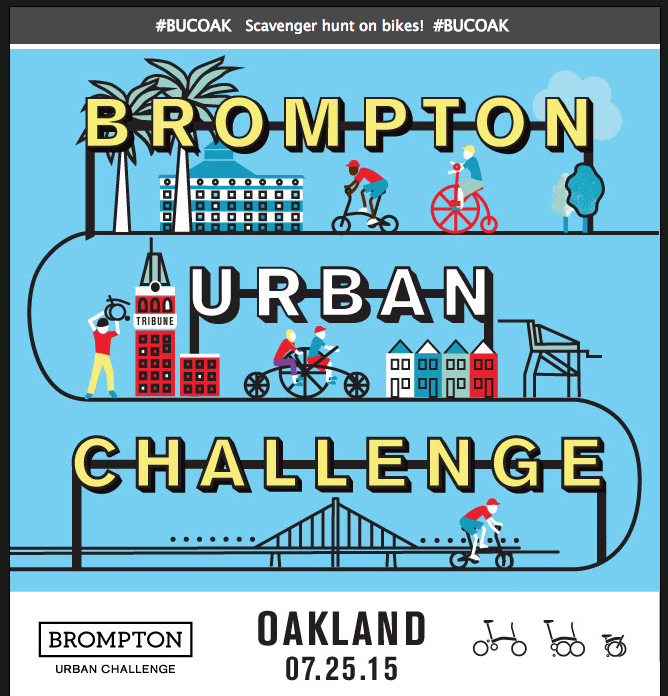 Surveys have shown that 85% of the people patronize their business come either by foot, bikes or buses. It is more than likely they are fighting the spaces for their own cars. In any case, what about when shops are not present, is parking spaces still required? 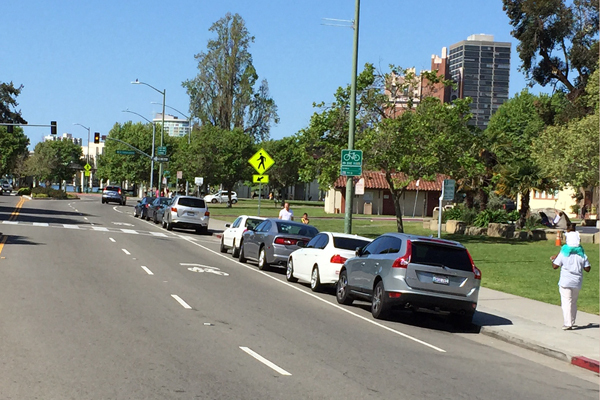 Nonetheless, I have found a few examples showing car parking is still given priority over bike safety when riding around the beautiful Lake Merritt in Oakland. On that section of Lakeside Dr., not one shop is present. You can hardly see the “bike lane end” sign to the right behind the parked car. This is a long stretch that doesn’t have either a bike sharrow or bike lane. 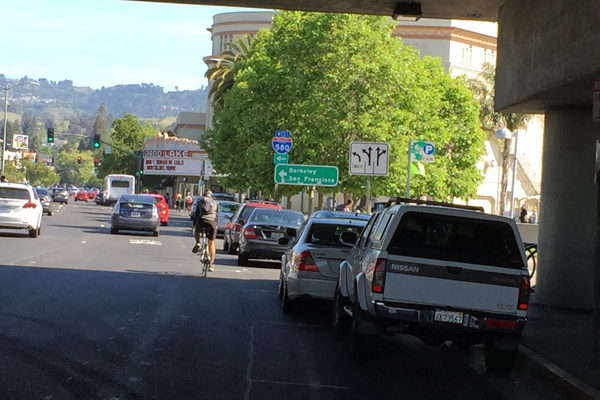 The photo above shows a typical dysfunctional bike lane. 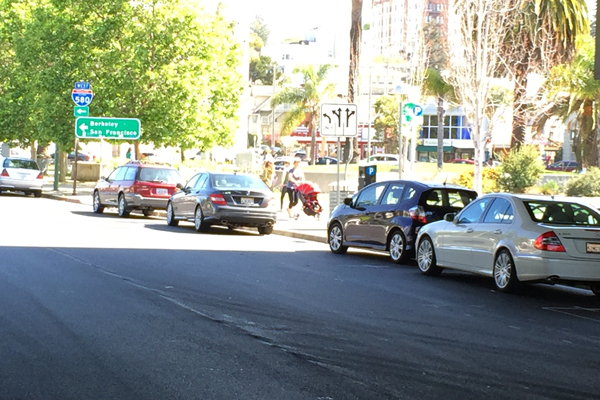 Bike lane ends because car parking takes precedence over bike safety. Obviously, there is not one shop there. So, why is car parking necessary? Don’t people come to the park to stroll, jog or picnic? 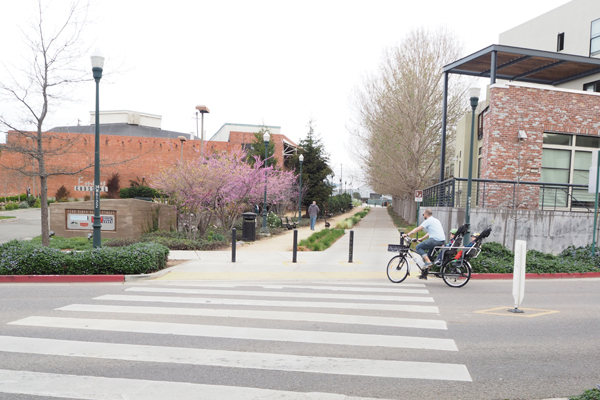 Any urban park like this should be promoting active transportation but not at this park. Not to mention, car parking ruins the curb appeal of this beautiful lake and endangers pedestrians when they cross the streets. And why is the “Bike Lane Ends” sign posted right where the bike lane ends. 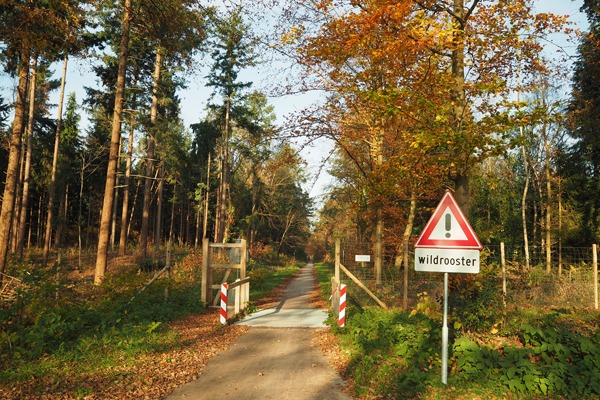 What do you want bicyclists to do when they see a sign like that? Go ride on the sidewalk? Pull over and walk our bikes? Also, the sign is not visible when it’s posted far away and behind a parked car? At the very least, urban planners should be placing those stupid bike sharrows beyond this point. Next, I want to show you (traffic planners) why a bike lane should be continuous. Below is a series of photos showing a cyclist is being endangered where a bike lane ends at Lakeshore Ave. and MacArthur Blvd. You could see that the cyclist was swerving away and resume it’s position afterward. 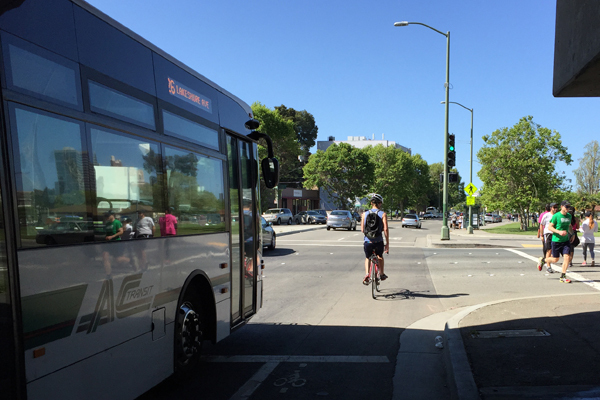 This is a problem every rider faces when a bike lane ends. This sure as hell is going to scare everybody who is on the fence of riding with the current bike infrastructure or there lack of. The reason for this is because up ahead there’s space allocated to a handful of parking spaces (photo 5 of the series). This section is adjacent to the 580 MacArthur freeway and bike lanes should be continuous to provide that safety to cyclists. 1. Bike lane ends and bike sharrow begins at Lakeshore and MacArthur Blvd. 2. 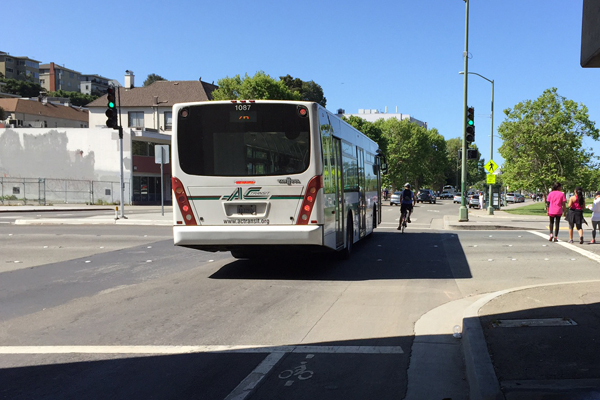 Cyclist has to swerve to let the bus go. A dangerous moment every time. 3. 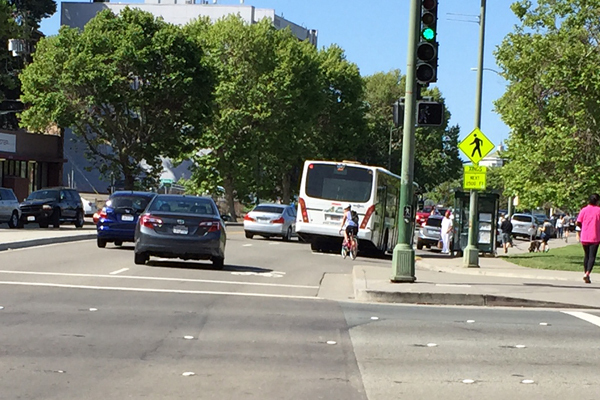 Cyclist has to completely pulled over to let the bus go. 4. Cyclist now has to resume its position in the middle of the road. 5. Car parking on Lakeshore Ave. and MacArthur Blvd. Do we need to sacrifice street safety for 7 parking spaces? I used to live in Grand Lake neighborhood and the scariest part of my commute is riding on this stretch. 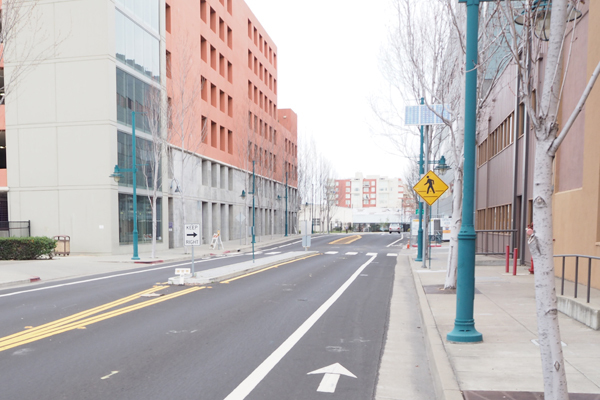 When I found out from Bike East Bay Coalition that they will installing bike lanes, I was excited to go check it out. Now they do have a bike lane but not yet painted (see dashed and light markings in photo), and new bike sharrows as seen in the photo below. So yet again, the same old theme still applies. A brand new bike lane that is half-assed because of car parking. This is especially bad, because it disappears at mid-block. A no-no protocol in any street planning manual. This area is on Grand Ave. heading north into Grand Lake neighborhood. Notice a new bike lane will be installed soon but disappears again for car parking. This is especially bad because it ends mid-block. Shops are nowhere in the vicinity. Just car parking for the park for 8 freaking vehicles over the safety of cyclists? Yes, there is a farmer’s market every Saturday but there’s also plenty of parking nearby, a parking lot under the freeway (not shown). Drivers can argue that a Grand Lake movie theater is nearby, however, there’s also another parking lot around there. I don’t see any shop around. The Grand Lake Theater up ahead has a parking lot nearby, so no need for these extra spaces for 8 cars. So, it boggles my mind to think that even when shop keepers are nowhere to be seen to fight for parking spaces for their presumed customers’ base, then why do we still having this ridiculous traffic configuration? What’s crazy is that a park is for people to enjoy tranquility and recreational amenities that a park provides, why is bike infrastructure so incomplete? 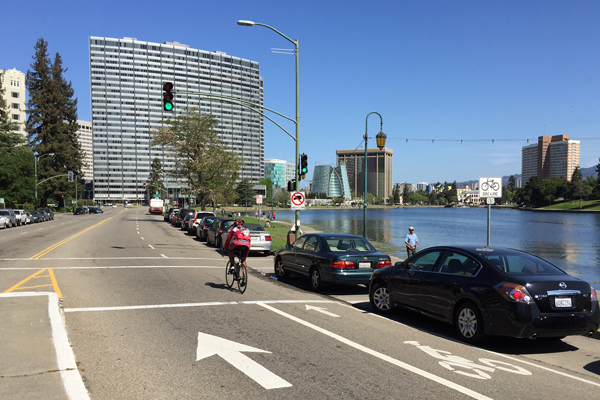 Lake Merritt is a perfect place to bike. It’s only 5.5 km (3.5 miles) in circumference, perfect distance for a nice ride. Moreover, you would think that any new bike lane installments, urban planners would know how to best implement them. But, of course bike safety is never in their mind to begin with, or are they just that incompetent? 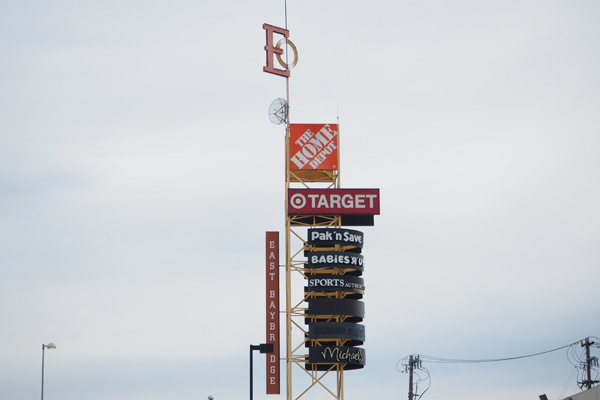 Emeryville, land of big box retailers. 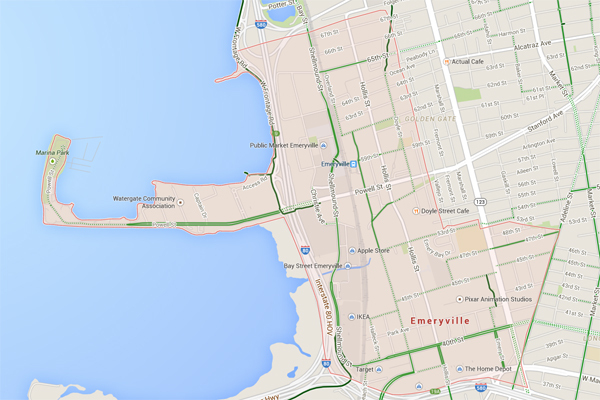 Emeryville, a small neighboring city west of Oakland is pretty interesting. It has a population density similar to Oakland at 2000/sq. km. 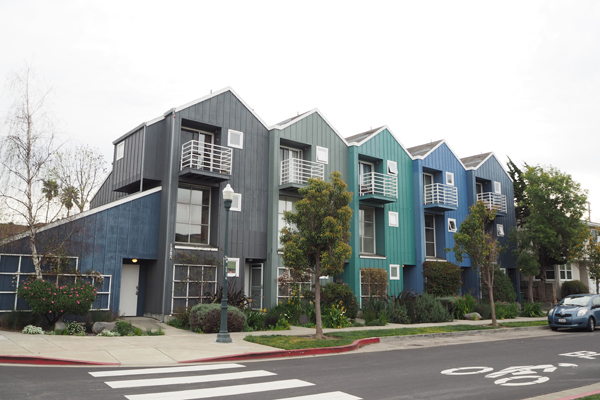 Emeryville is not completely a suburb and yet, it’s not an urban city either. 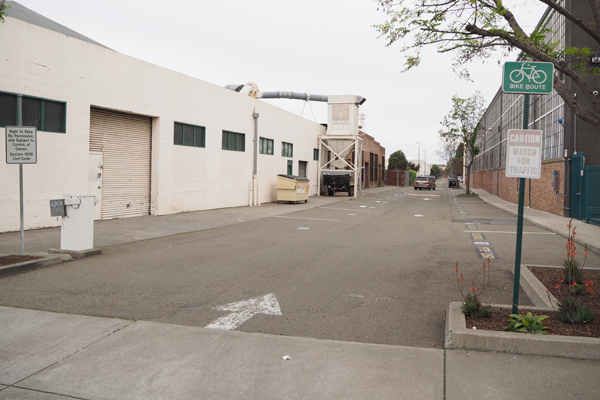 It is full of companies like Pixar, Bayer, Novartis, Jamba Juice and Clif Bar. It doesn’t have light rail transit but it has a station for Amtrak. Moreover, there is a free shuttle service, Emery Go-Round, that takes you almost every where in the city and runs on weekends. But then again, it’s very car-centric with big box retailers like IKEA, Home Depot, and Target. A small city east of Oakland with a population of 10,000 and a density of 2000/sq. km. What is so interesting about this city are the residential streets. 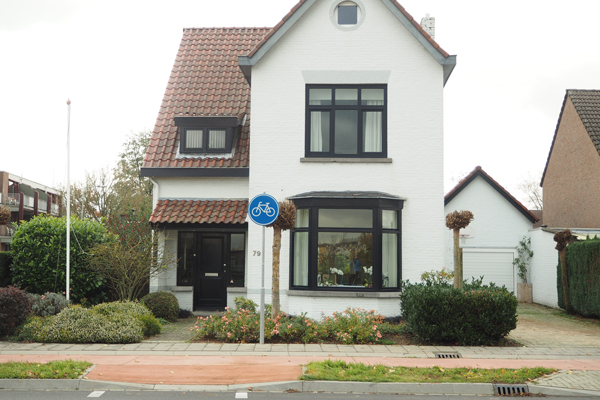 A majority of side streets are marked with Bike Blvd symbols and width of the streets are comparably narrow. When you ride your bike on major arterials it is pretty scary despite having bike lanes. Traffic lights on major streets take forever to turn green and bike lanes are narrow and next to multiple vehicle lanes. 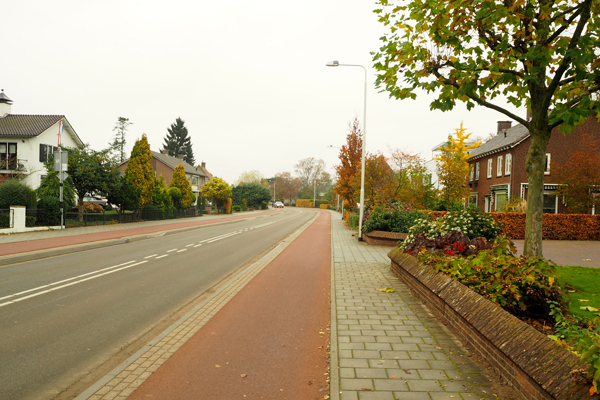 But it’s completely a different pace and feeling when biking on the residential streets. Residential streets are marked with bike blvd stencils. A children’s park on 61st and Doyle St.
As a matter of fact, it’s quite family-oriented. There is a children’s park, a community garden and a recreational park. Many homes are detached but have small footprints, while most newly built homes are in apartment or condo-style. One progressive neighborhood I want to bring up is on Doyle St. It sort of reminds me a little of the Netherlands. 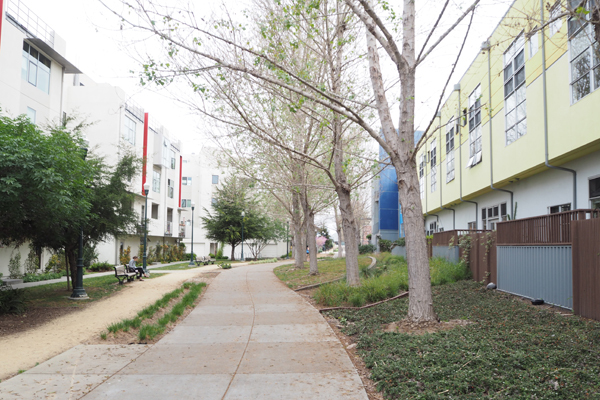 This neighborhood has an off-street bike path that starts on Doyle St. and Ocean Ave. and ends on Murray St. in Berkeley. I thought it’s pretty cool to have something like that outside your home. I find it suitable for children to ride for fun but it’s not sufficient for active transportation for adults. Because it’s a shared path with pedestrians, it needs to be wider. 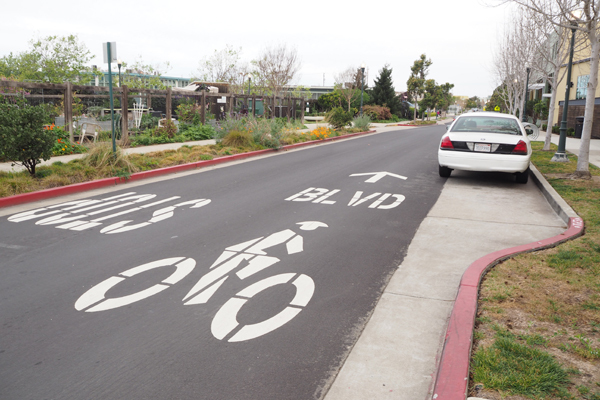 Off-street bike path in Emeryville. Shared path between pedestrians and cyclists. Too narrow to be suitable for active transportation. Another pitfall about the off-street bike path is that when it is interrupted by a street, there is no speed bump to slow down drivers. Instead, shark teeth signs and street signs are there to alert drivers to yield. However, I find this in-effective as I already saw some drivers passing through it without slowing down. When the off-street bike path is interrupted by streets, shark teeth signs are marked for drivers to yield. 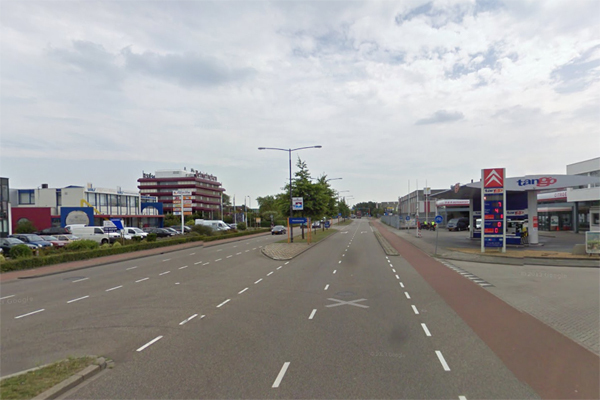 In the other parts of the city where large businesses are located, middle dividers or small neon signage are placed in the middle of road at crosswalks to calm traffic. 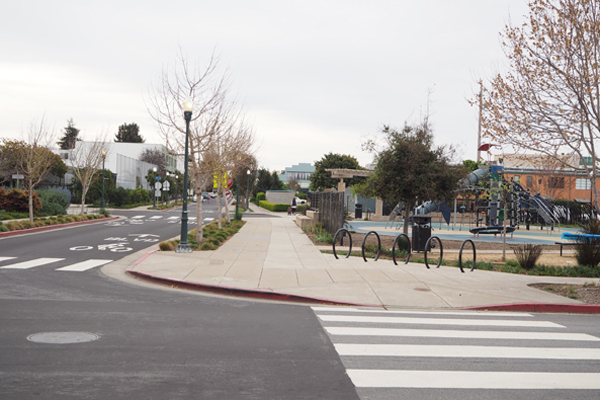 A middle island to calm traffic on Horton St. where major companies are located. Driveway that is also a bikeway. A smart use of public space. Reminds me of the red brick row homes in the Netherlands. New homes typically look like these contemporary homes. It is always nice to see children on bikes even if they are not biking. 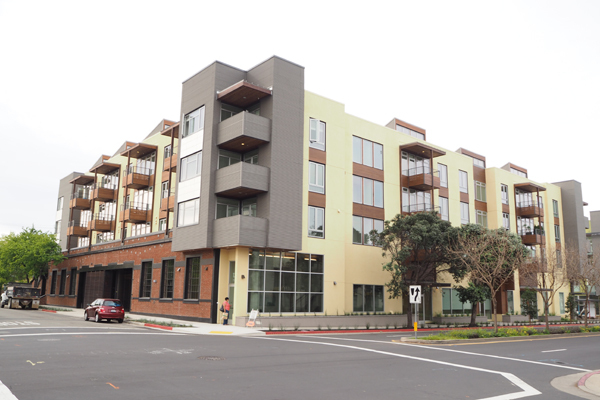 As a bonus for its residents in Emeryville, they can enjoy its proximity to the Bay Bridge. I see many cyclists going through Emeryville to a bike trail that takes them to the end of Bay Bridge’s eastern span. Pretty cool to have this in your backyard. I am surprised of how bike-friendly this city is. It is a land of big box retailers with big office parks and they still can pull it off with bike-friendly infrastructure. Kudos to its urban planners. I hope you continue making your city a better place to bike! 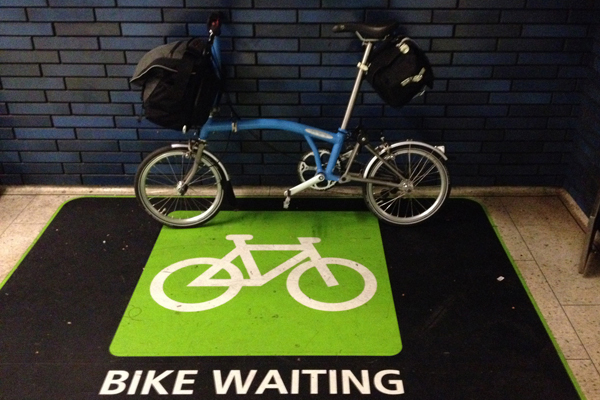 My Brompton with a Brompton C Bag and a Carradice Nelson long flap saddle bag at an Oakland BART station. There are many options to travel on the plane with a Brompton. You can get a suitcase or a hard case that is designed for a folding bike, you can box it up at home or at the airport, you can also try gate-checking, or bring it on the plane as a carry-on. I took a combined approach. Because I wanted to be able to ride to and from the airports and not having to rely on taxis or transits, I decided to get a portable transport bag and checked in my Brompton. Moreover, I already have enough stress as it is from flying, I didn’t want the extra stress from dealing with TSA and gate-checking staffs. 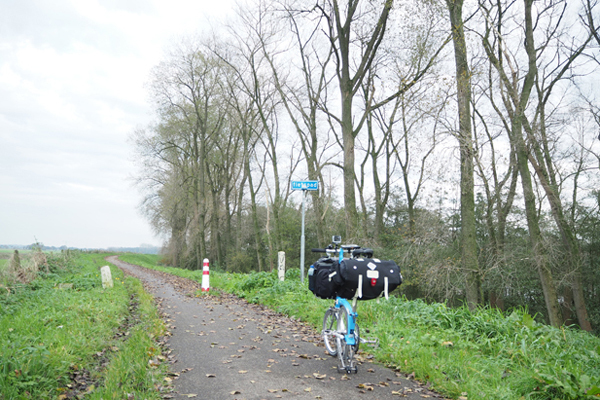 The Nelson long-flap saddlebag and the Brompton C bag were enough for a month’s bike trip. I took my Brompton along with a Brompton C Bag and a Carradice Nelson saddlebag to the BART station and arrived at SFO. The C Bag was big enough to fill 3-4 days worth of clothes and a laptop, while the saddlebag is filled with electronics, bike repair kits, and a transport bag. I have the Nelson saddlebag hooked up to a quick release clamp for easy on/off the saddle. Traveling during the rainy and cold season for a month requires some extra gears and because I wanted to blog while I was there, extra electronics were needed as well. 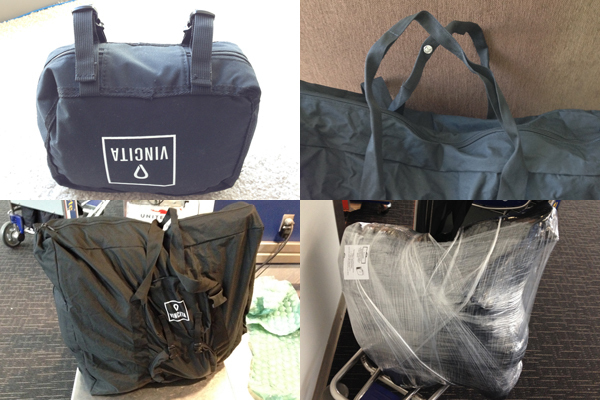 These extra things made both bags very heavy and bulky, and a real hassle to bring my Brompton as a carry-on. This transport bag by Vincinta served my purposes very well. When it’s folded, it’s small in size and can be mounted on the handlebar, bike frame or on a saddle with loops. 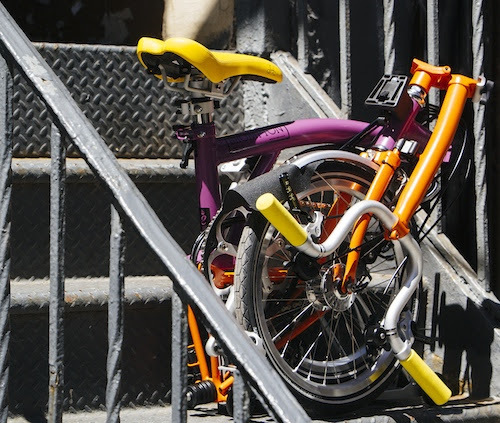 When it’s opened, there’s enough room to shove in clothes or what have you to protect your Brompton. 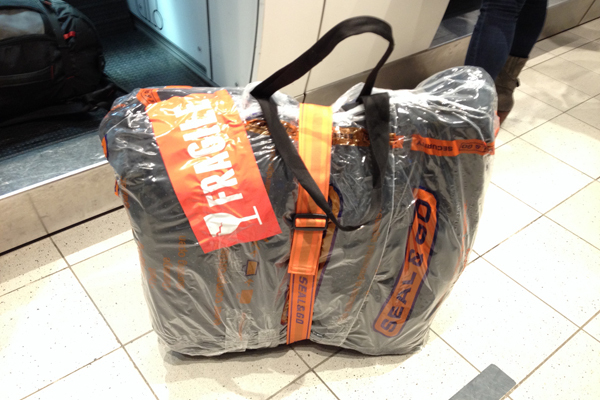 When I arrived at SFO, I whipped out the transport bag and put my Brompton in at one of few shrink-wrapping stations. I didn’t remove anything from the bike and just tightened the hinge clamps. Then I stuffed my 3 separate plastic bags of clothes, two on both sides and one on top of the Brompton, all to protect the frame. And had the clerk shrink-wrapped it to keep everything in place. I asked the clerk whether he has a fragile sticker and he didn’t. The cost of shrink-wrapping was around $10-20. You can also have it bubble-wrapped too before putting it in the transport bag but that would cost extra. Is this ideal for rolling your bike up the stairs or what? There is no sign saying bikes are banned. After arriving in Schiphol Airport in Amsterdam, I unwrapped near the baggage claim where there is a nearby desk for assistance. I asked for a scissor and started cutting the shrink-wrappings away. And my bike came out in one piece! As I walked around the airport, I scanned for anything that would serve people on bikes well. I saw this escalator that could be possibly for people with bikes. 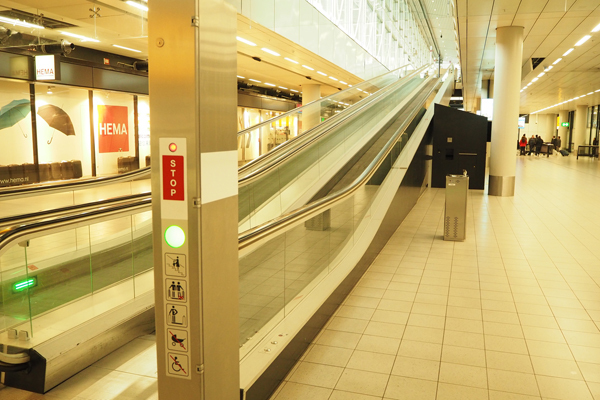 The ramp escalator can be activated to move in either direction. The incline is not as steep as a regular escalator and no steps which make it perfect to roll your bike up and down the ramp. Ingenious! I want to call this a “bike escalator” because this type of escalator is used in a few bike garages else where in the Netherlands. What about showers when you arrive at the airport sweaty from riding your bike? If you ever come riding to the airport sweating, there are showers that you can use. I don’t know how much it cost, but I am sure your flight mates would appreciate you not smelling. Moreover, in the basement floor of the airport, there are medium and large sized lockers that you can store your Brompton. 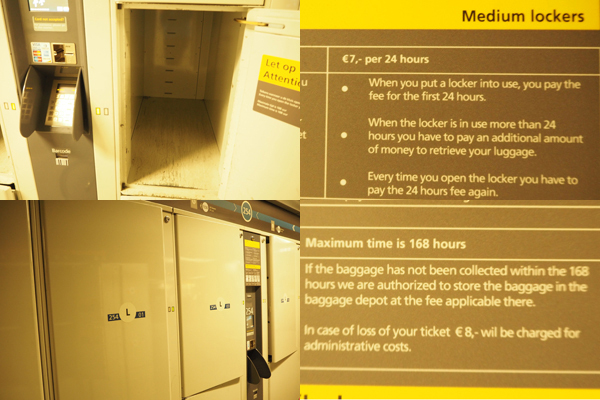 The medium sized locker costs 7 euros/24 hrs which can fit your folded Brompton easily. The large sized costs about 9 euros/24 hrs. Either locker can be used up a maximum of 7 days which then your baggage will be stored in the baggage depot nearby at the same rate. The baggage depot carries boxes for bikes but they are for regular sized bikes. You can just cut it up to turn it into a smaller box. 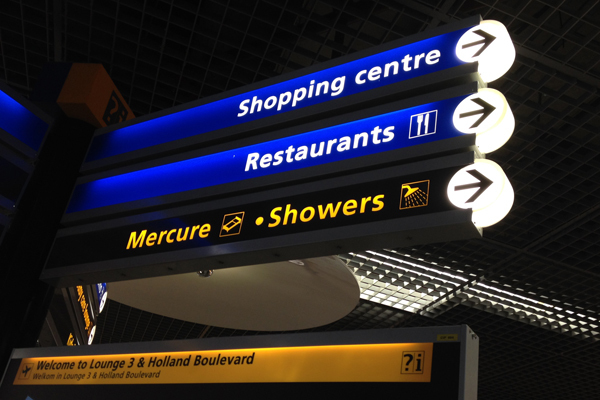 Medium and large sized lockers, along with boxes for bikes can be found in the basement floor at Schiphol Airport. 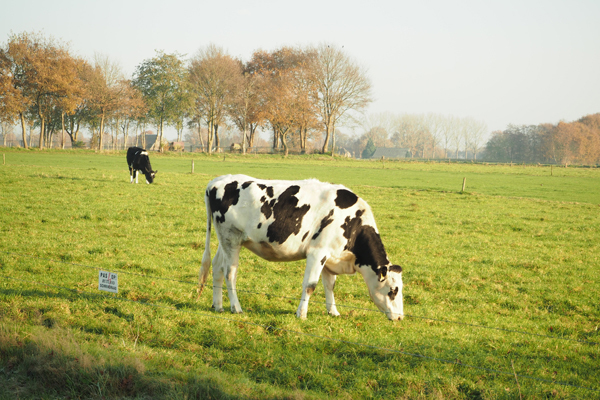 When I arrived in Amsterdam I was too tired to ride to Leiden which was my original intention. So instead, I rode the NS Intercity train which is conveniently connected to the airport below ground level. You can buy fares at a counter or at a machine. If you bring on a full sized bike, you will be charged 7-8 euros extra on a trip. A few times I brought my bike unfolded onto trains without any question asked. However, I folded partially when there are people around. 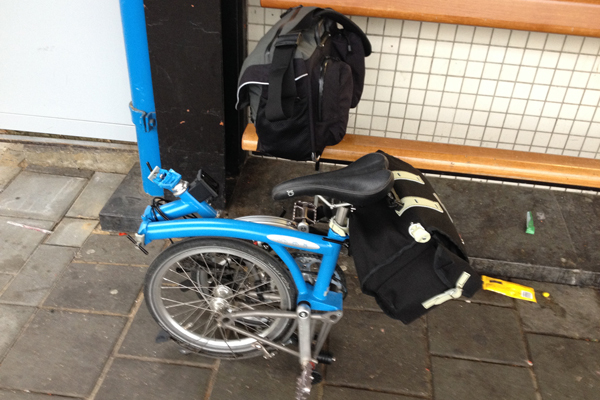 A nice thing about Brompton is that you don’t have to remove any bag when folded partially. Conventional bikes need special tickets and are not allowed during rush hours from 6:30 – 9:00am and 4:30 – 6:00pm. Folding bikes is mentioned as a luggage if folded away. 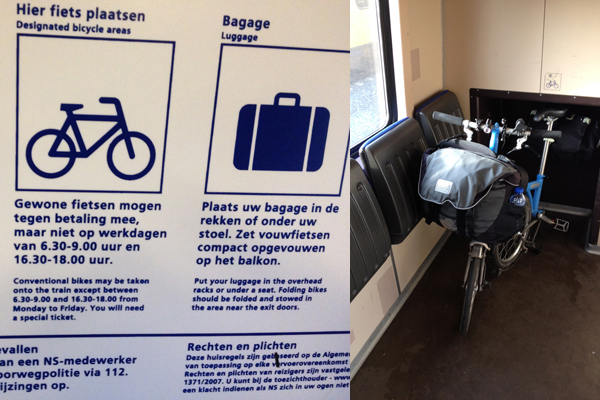 Space for bikes on trains are limited. The NS trains go through every cities and stop conveniently in the heart of city centers. Huge bike parking garages are right there when you exit the stations. These are secured parking with staffs and bike repair booths. And there are charging stations for e-bikes! There are large sized lockers at these stations too that have enough space to store your Brompton or heavy baggage overnight (around 6 euros) or longer at an increasing sliding rate. I can say that very few passengers take their bikes on trains and which by design, space for bikes on train is limited, barely fitting a couple of bikes per bike-dedicated car. 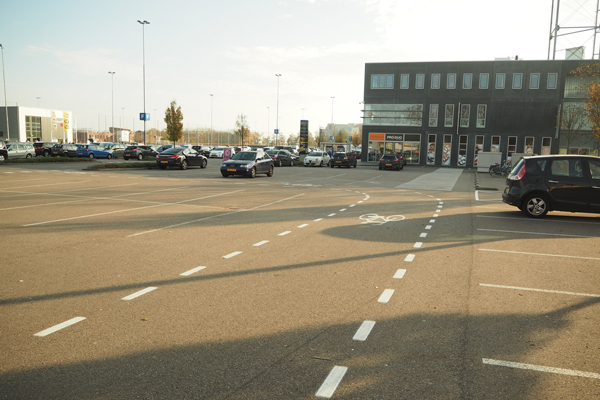 This is a state of the art parking facility in Utrecht that accomodates 4500 bikes. The first 24 hrs is free, after that, daily rate is 1.25 euros for bikes and 2.50 euros for cargo bikes. They also have bike rentals and bike repairs. 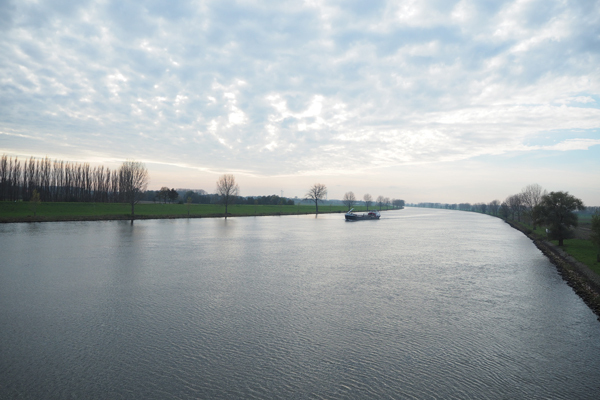 The Netherlands are known for their water ways but not everywhere are served by bridges. To help with crossings, water buses are strategically located. Some are free but many charge a fee of around 2 – 3 euros. No worries if you don’t know how to use the ticket machine. Just pay the staff when you are on the water bus. 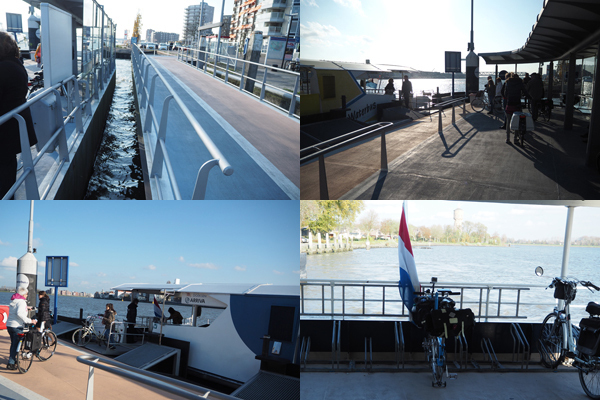 These water buses are nice and comfortable, and they have bike racks for both small and regular sized bikes, which are located in the front of the ferry. Water-bus station at Dordrecht. A bike rack that fits at least a 16″ inch wheeled-bike. 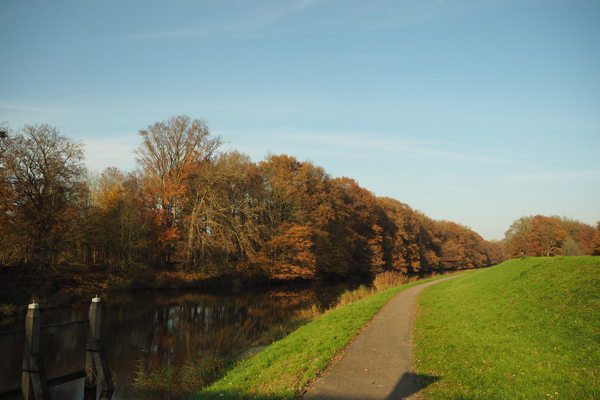 During the November in the Netherlands, I was fortunate to have only a few days rained on me while riding. I rode to 13 some cities via some small villages and took transit to 4 cities. On bike, I did about 300 miles and it was pure satisfaction! Where there’s pavement, the bike path is smooth. Where there’s no pavement, it only happens in rare occasions. I got a chance to ask Mark at BicycleDutch, when was the last time he got a flat tire on his bike. He said about 20 years ago! Yep, if I had known that, I would have lightened my bag by leaving some bike parts at home. 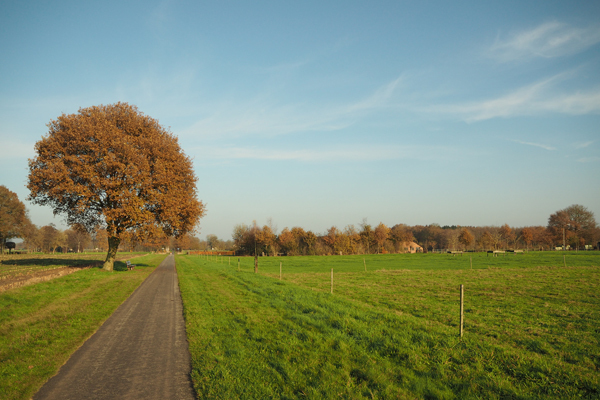 The cycle tracks are constantly flanked by both sides of tall autumn trees and green pastures. 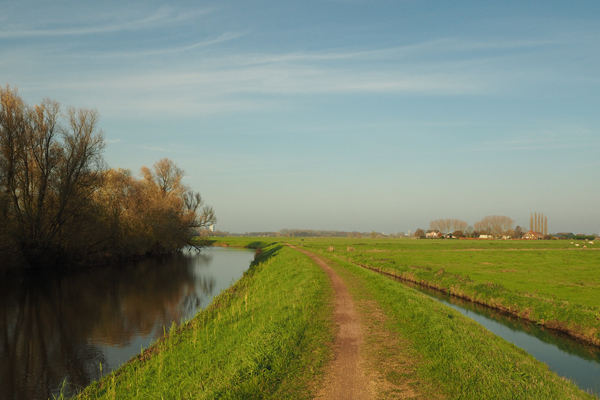 More often than not, water ditches line between bike paths and the cows and horses grazing. In these water ditches, I saw swans, ducks, and geese. 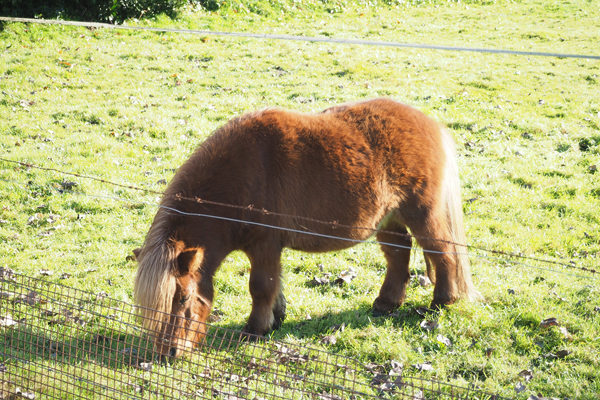 I saw a lot of ponies and I was wondering if ponies are one of Dutch favorite pets. And I still wonder. There were instances where I rode for at least 10 miles without sharing any road space with cars. 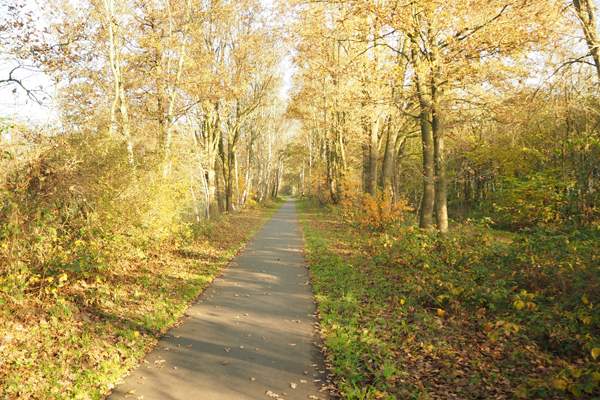 Sometimes, I find my bike chain noise was the most annoying noise on the cycle track. Sometimes, I passed several groups of kids on bikes riding home from school far away from my destinations. 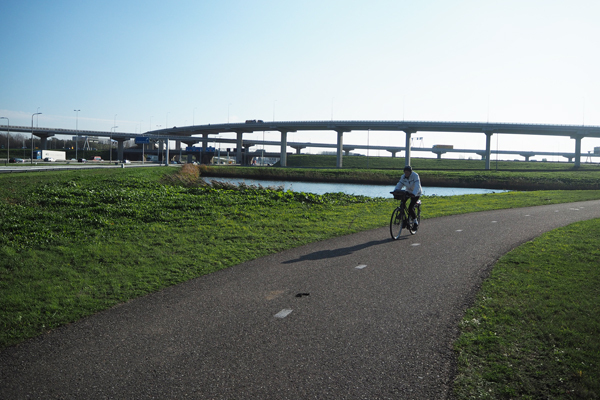 Getting to Schiphol Airport by bike from Amsterdam is as easy as riding anywhere in the Netherlands. 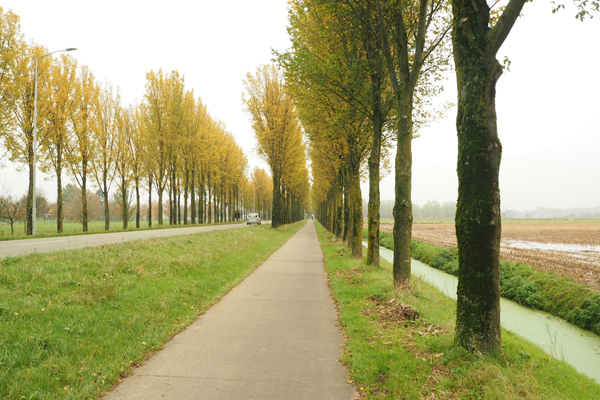 Most of the way was consisted of cycle tracks and some through shared side roads with cars. As usual, I relied on Google Maps on my I-Phone which was accurate 95% of the time. The other 5% I relied on street signs on cycle paths which are color red coded, different than the blue signs for cars. Again, I didn’t bother with bringing my bike on the plane or gate-checking it. I went the safe route by wrapping the bike with clothes. The packaging booth doesn’t shrink wrap or carry bubble wraps because of security restrictions, so I had to buy a strap from them to keep my clothes attached to the bike. That’s something to think about when you are flying out of Amsterdam. I do recommend two straps for more secured packing. The plastic wrapping costs about 10 euros. The good thing is that they have “fragile” labels if you ask. Ask for a “fragile” label if you decide to check in your bike. I would do this again with my Brompton. 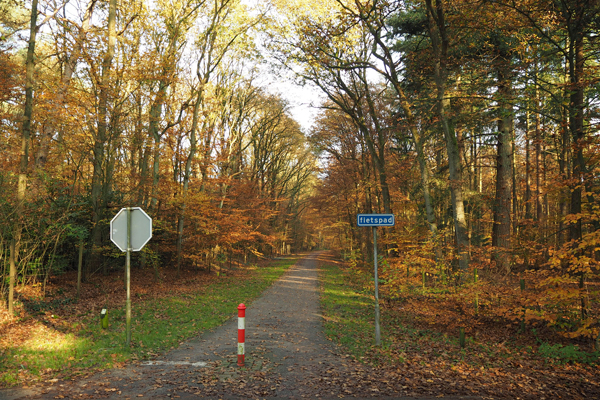 It complements bike touring the Netherlands very well. Because it’s flat and easy to ride around, I didn’t have any difficulty with 16 inch tires and 2 speeds. Some hotels have very small and some even don’t have elevators with steep narrow stairs, but I didn’t have trouble managing it. Flashing bike lights are illegal, so bring spare lights, extra batteries, chargers, etc. Bring music too! The only complaint I have about the trip was that my baggages were too heavy to go any faster and longer. 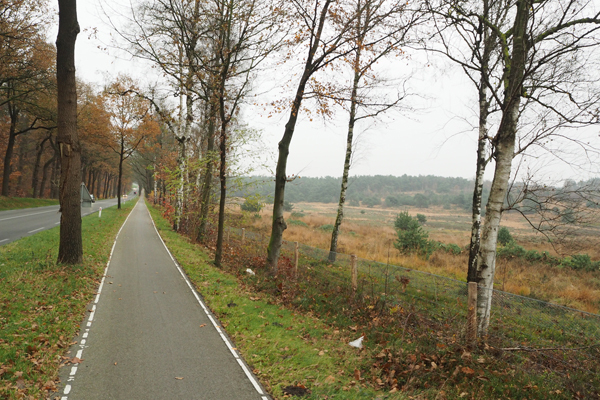 The Netherlands is a beautiful place for cycling. 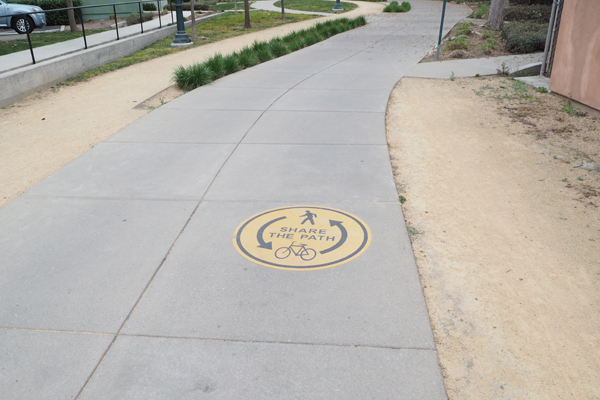 Wherever you are, a bike path is footsteps away. 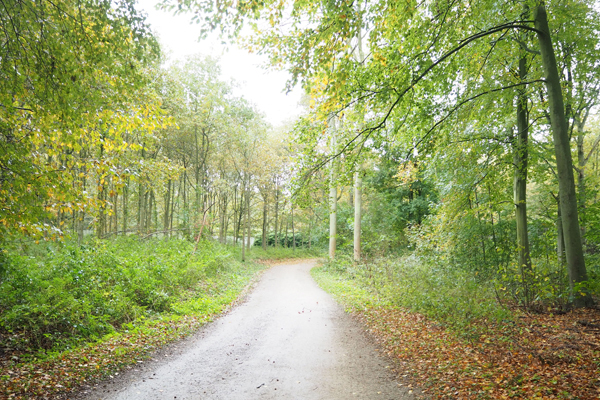 The air is always fresh and pleasant, and you are away from car exhaust fumes. The built environment, whether the manicured trees or the row of brick houses, is intimate and human-scaled. It’s really safe, as expected. Drivers are considerate and mindful because they are also cyclists. I didn’t bring my helmet and rode everywhere without one. From the first day to the last day of my trip, I was just as amazed and awestruck. 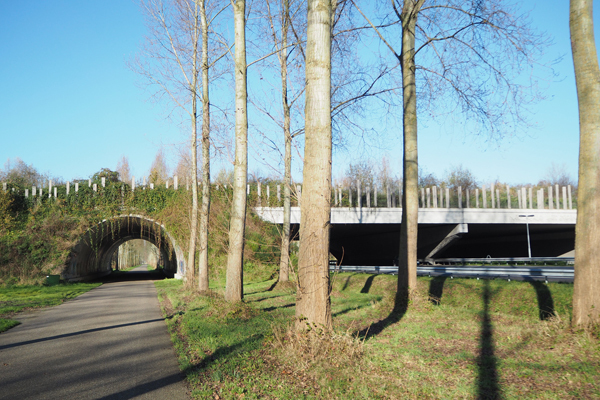 The cycle bridges are true wonders, the cycle tracks are long-lasting, and the number of people riding are like music to my ears. 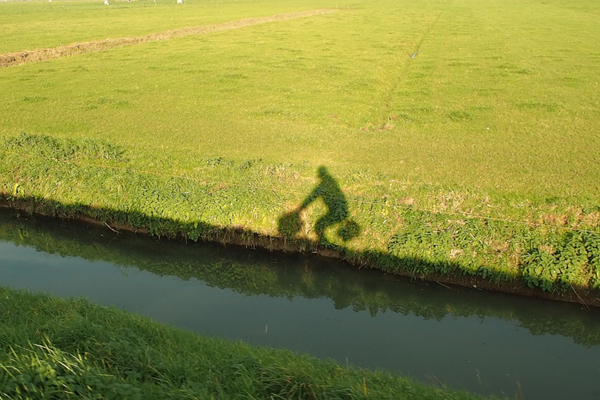 Me and my Brompton in Bike Utopia…I will visit, again. Welcome to a New Year! And to start a fresh year, let’s have a happy treat for your bike! We have a product to review that you may like. It’s from Monkeylectric, made right here in Berkeley, USA. Nellie used to have the first Monkey Light, the Original M133 (now discontinued) and it was great while it lasted. However, it was really bulky, heavy, and conspicuous. In the recent times, they have come out with four new and improved different versions – M204, M210, M232 and Pro; price ranging from $26 to $900; in different sizes and in number of lumens. 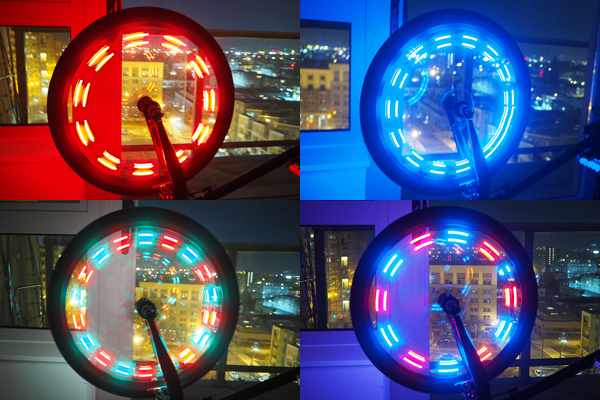 M204 bike wheel light comes with 40 lumens, it’s waterproof, and has 5 themes. The smallest and lightest one is M204 model, which I found to be pretty affordable at $26. It claims to have 360 degrees visibility but it’s not so visible from either the front or rear view. 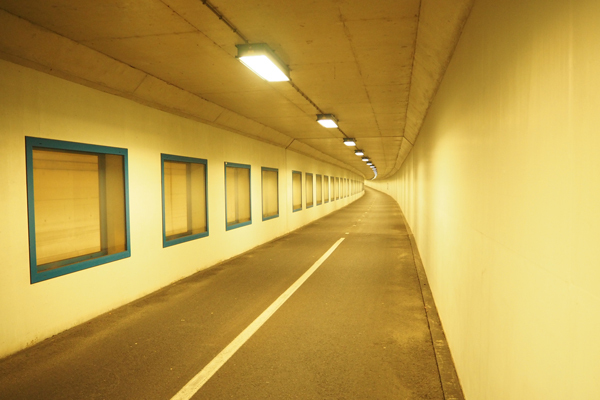 The 40 lumens light is very visible from the sides but it’s still best to complement it with head and rear lights. It takes 3 AA batteries, lasts up to 60 hours of runtime, and fits 16″ and larger wheels. M204 is solidly built with silicone material encasing a computer and 4 LED lights (two on each side), making it waterproof. Good for going through wet puddles and rain. There are two user-friendly buttons, one is an ON/OFF switch and the other one is for switching to different colors and themes – 8 colors and 5 themes, which is plenty to play with. 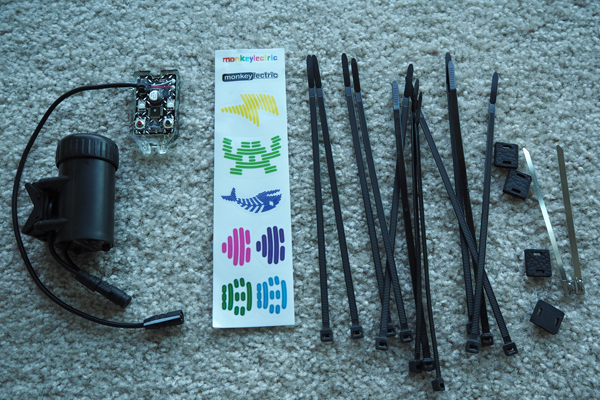 These are the parts that come with the package – a power supply storage for batteries, computer/LED lights, plastic straps with rubber blocks to tighten to wheel spokes, and 2 steel anti-theft fasteners. And installation is a cinch. It took me about 5-10 minutes. 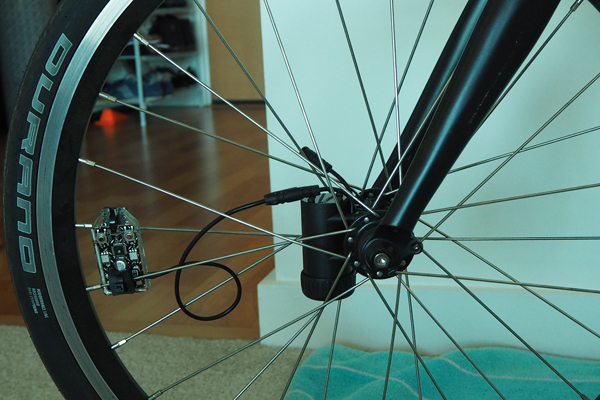 First, strap the computer/LEDs with two fasteners and rubber blocks to the wheel spokes. Then tighten the battery hub to the wheel hub with two fasteners, making sure they are aligned with the computer/LEDs for balance. Then connect the black wires. Done! The battery hub should be aligned with the LED lights for balance. 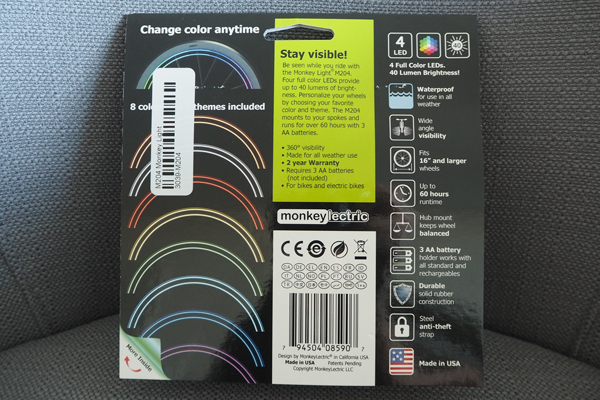 The Monkey Light uses 3 AA batteries and has a run time of 60 hours. That is pretty long. Because of the 3 AA batteries, it makes it visibly bulky and somewhat heavy but a great improvement. I would prefer it to have a USB cord or a rechargeable battery pack although it may sacrifice run time. I just don’t like waste and batteries are not cost-effective. These images are to show examples of colors and themes. Note: this is a camera effect. You would have to ride super fast and at the right speed to get this effect. Or it may help by combining two M204 lights on each wheel. For an inexpensive light like this, it’s hard to beat. It’s fun and yet, has a practical function- safety. 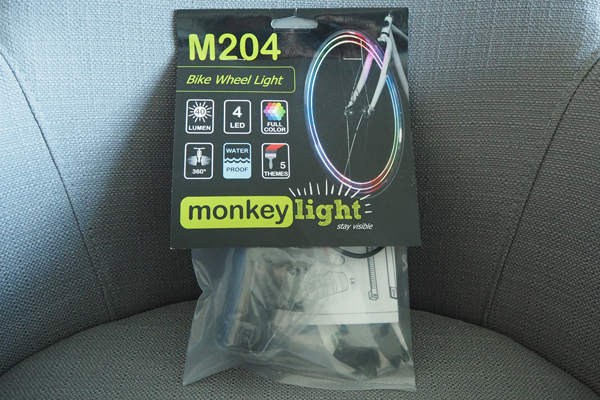 M204 model has a total of 24 colors/combinations from white lighting for even more visibility to pink lighting for those of you expressing cuteness to rainbow colors for Bike Party fun-ness! And a two year warranty to boot that will guarantee its worth.